If the recent releases and subsequent online success of Sight and Plurality are any indication, we are in a new age of sci-fi short nirvana—a time where budget can no longer limit one’s cinematic imagination. 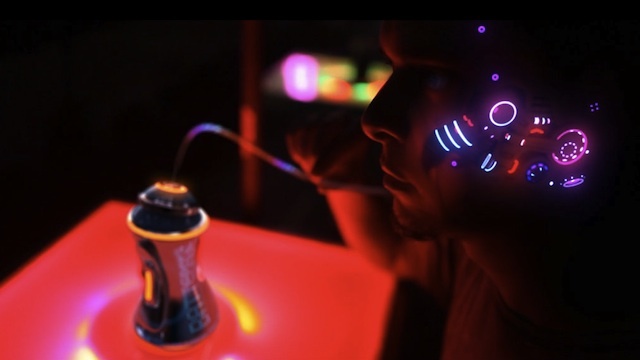 True Skin, the new special effects driven short from writer/director Stephan Zlotescu, is yet another entry into what is quickly becoming a crowded marketplace. But, as we keep seeing over and over when it comes to the world of short science fiction stunners, Hollywood is most definitely listening. True Skin takes place in a futuristic world where human augmentation is the norm. “Naturals” are being phased out in favor of more cutting-edge models. Kaye, our protagonist, finds himself on the run for stealing a particularly advanced modification. Then, as they say, it’s off to the races through the gaudy streets of a new age Bangkok as Kaye finds himself in danger of losing more than just his humanity. If the concept of cyber modification isn’t completely unique (i.e. Neuromancer, Deus Ex), the film’s representation of the subject definitely is. Gone are are the normal post apocalyptic conventions—the expected bleak grime and monochromatic hues of precedent. In it’s place? A cyber video game world that is as familiar as it is unique. This is post apocalyptic by way of Skittles—a candy colored rainbow of neon electronica. Taste the rainbow of human genetic misery. Taking a page from Gareth Edwards’s Monsters, True Skin was shot in a real world location that was later modified extensively in post production. Essentially, the Bangkok setting serves as a blank canvas on which the team was able to paint their garish vision of the future. The result is visceral, loud, and far more tangible than something produced solely within the confines of a green screen studio. It looks fantastic. Structurally, however, True Skin doesn’t feel like a contained short as much as it serves as a showpiece for what could be possible in the longer form. Narratively that hurts the film—think over expository voice over to fill in the gaps. It’s clear that Zlotescu has much larger aspirations than the provided six minute runtime, and the entire piece feels overstuffed as a result. But, the visuals are so crisp, so bleak, so unexpectedly colorful, that it’s hard not to be taken for a ride. If past convention is any indicator, we may be seeing a larger expansion of True Skin‘s world soon enough. Let’s just hope that general audiences are ready to gorge themselves on all that eye candy.